Presenting the World's Fastest Manicure. Ok, not really. But it was pretty quick for me: start-to-finish it was less than 45 minutes of work, including dry times. Whenever I'm in a time crunch, I always turn to the polishes with the best formula...and glitter. Glitter makes everything better, no matter how much I hate removing it later. Fingerpaints brand has always been good to me. I've never had a bad bottle. This is three coats, but if I had slowed down a bit, I probably could have done two and been fine. I added two coats of glitter to my ring and middle fingers, because I can't abide solid nail colors anymore. 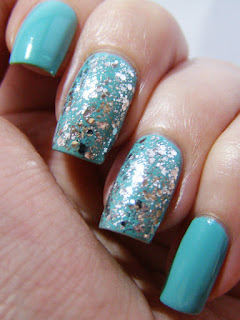 I do love this glitter. It's almost perfectly smooth under a normal topcoat which makes me ridiculously happy. Plus, this stuff is like wearing a tiny disco ball on my nails. Who doesn't love that?